Description: Synthesis from "Westermann Grosser Atlas zur Weltgeschichte", 1985, ISBN 3-14-100919-8, "Atlas des religions", hors-série, ed. du journal le "Monde", Paris 2007, 194 pp., "DTV Atlas zur Weltgeschichte", 1987 traduit chez Perrin, ISBN 2-7242-3596-7,"Putzger historischer Weltatlas Cornelsen" 1990, ISBN 3-464-00176-8, "Atlas historique Georges Duby", Larousse 1987, ISBN 2-03-503009-9, "Atlas des Peuples", André & Jean Sellier, La Découverte : "Europe occidentale" : 1995, ISBN 2-7071-2505-9, "Europe centrale" : 1992, ISBN 2-7071-2032-4, "Orient" : 1993, ISBN 2-7071-2222-X, Történelmi atlasz, Magyar Akademiai, 1991, ISBN 963-351-422-3 CM et dans l'Atlas istorico-geografic, Academie Româna, 1995, ISBN 973-27-0500-0, approximatively according with some others as , File:Religions d Europe.png or , completed since some hungarian and greek sources. The catholic minority of Voivodina is the Magyar one. 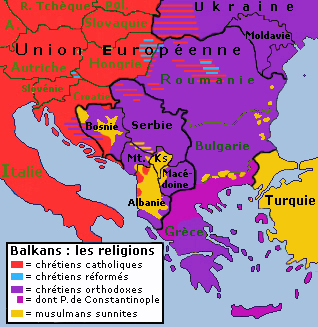 The Constantinopolitan Patriarcate's juridiction in Greece is not a "separation" but one of the Greek Orthodox churches (sense of the word "dont" in French).